Today was officially Allie's last day of private speech therapy. She has been getting private therapy the whole summer but it's now come to an end. We aren't giving up on Allie's speech, she will be starting therapy through the school system again. 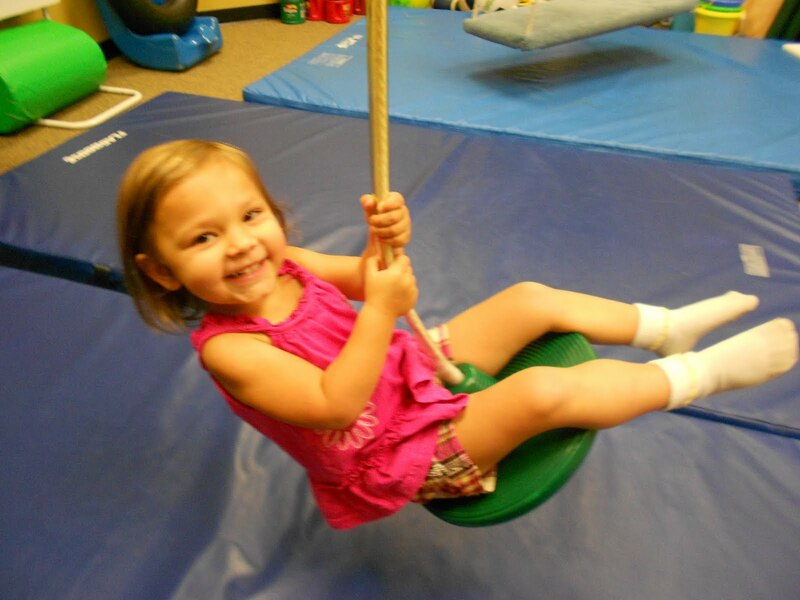 She will receive speech therapy once a week for a half hour. We would like to thank Ms.Anna and everyone at Therapies + for all the wonderful work they did with Allie. Throughout the summer, Allie receive speech and feeding therapy twice a week for an hour each time. 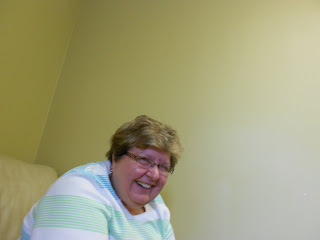 Allie loved her therapy and looked forward to it all the time. 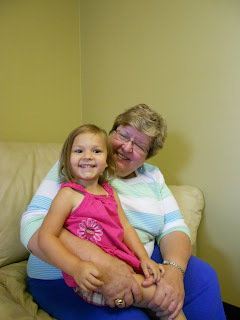 Ms. Anna was great with little Allie and she spoiled her. I was pleased because Ms. Anna had a ton of patience with Allie - working with little Allie can be quite a challenge!!!! As with every professional we have worked with, Ms. Anna would like to keep updated on Allie's medical progress. As I have mentioned before, Ms. Anna has not worked with anyone quite like Allie - basically every ability to eat but refuses. Most of the children she works with has difficulty chewing, swallowing, gagging, or food aversions, etc. So, Allie continues to be a mystery and everyone is interested in her progress. Allie was sad to leave therapy today and she loved hugging Ms. Anna. I was happy to see it because she sure gave Ms. Anna a run for her money. I will never forget how hard Anna worked on getting Allie to eat, and how Anna came to our house for free just to observe our meal environment and to help Allie eat. Of course we couldn't convince Allie to get enough but it was all worth a try. So, thank you again to all of the wonderful therapist that have worked with Allie this summer. We will miss you and who knows, we just might be back if something changes! Met with Allie's GI doctor today for a typical follow-up. Allie hasn't gained any weight since we started tube feeding her again. She has been back on her tube feeds for a couple weeks so she should have started to gain weight. To be honest I'm not surprised because it takes Allie a long time to gain anything. So, Dr. Brown is having us add "Duo cal" to her blenderized diet. I figure it's worth a shot. We go back for a weight check in a month and if she's still not gaining at a normal rate, we will put her on Periactin to try and increase her hunger. Dr. Brown was happy we went to see a pediatric endocrinologist. He was very impressed with the tests they were running and he said hopefully some of the results will give us answers. He doesn't want to make any changes with Allie until the test results come in. 1) You don't want Allie to have a bad feeling about eating - you want her to enjoy it. 2) You don't want Allie to develop any food aversions especially since she doesn't have any right now. So, I take that as the 2-week inpatient program might not be the right decision for Allie. Of course he couldn't come out and say that because he knows the program is great - just maybe not great for Allie? I guess Matt and I are going to have to make this decision since nobody else is willing to make it for us - lol. We have an appointment on September 7th at the CHW to see if Allie is even a candidate for the program. She is currently on the waiting list but we don't have to accept her place if we don't want to. Dr. Brown and I discussed the fact that her new endocrinologist thinks maybe Allie has turner syndrome. He thought it was a possibility and he recommended she get tested eventually. Today Allie's weight was 25.6 pounds and her height was 34.5 inches. She's still a little peanut!!!! 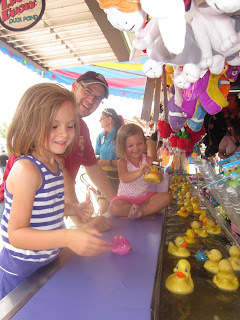 Girls and daddy playing the ducky game - where everyone is a winner!! Allie's appointment with her new Endocrine doctor went well. 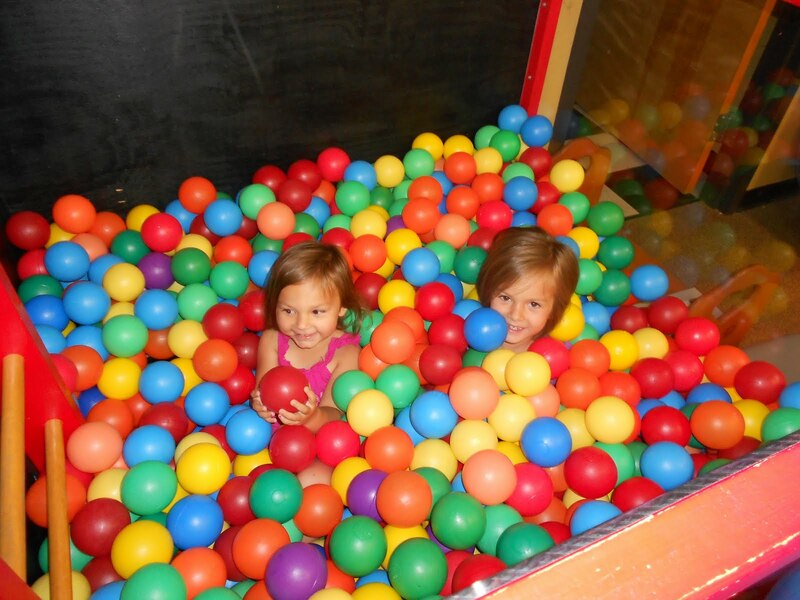 An extensive history on Allie was taken and it was determined that Allie is extremely small for her age. However, once again she received the diagnosis, "small for gestational age". That diagnosis comes along with many other things, too many to list so if your curious, please feel free to google it. The doctor examined Allie's hands and her pinkie finger showed proof of small for gestational age - short and the middle section fatter than the rest. Just another indication her bones may not be growing properly. We don't know why Allie isn't growing properly, but she did get extensive blood work done yesterday to check for several things. Allie also got a bone age test done (X-ray of her had) to determine her bone age. She had this test done back in 2009 and she was right on target for her age. 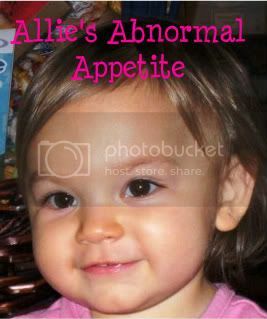 However, Dr. Chaundry said yesterday that she is hoping Allie's bone age comes back young for her age because if it comes back at a 3 year old level, something else might be going on. 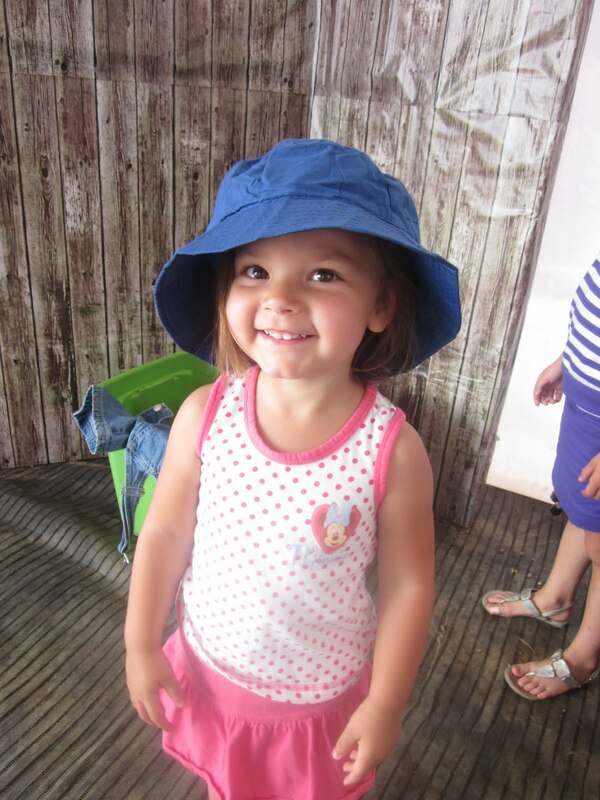 She shouldn't have such a small figure and bone structure at the age of 3 (if her bone age is truly a 3 year old level). Anyway, I'm trying not to stress until we get her bone age back from the doctor. Dr. Chaundry is checking Allie's IGF1 which also plays a roll in her growth hormone and bone growth. It was brought to my attention yesterday that Allie had this checked back in 2009 at the Children's Hospital of Wisconsin and it was low. Several months later, it was rechecked and it was normal. Malnutrition can play a big part of her IGF1 so it's possible she had the test done before she had he feeding tube and that made her results low. Dr. Chaundry commented on how "yellow" Allie looked. She did blood work to check her creatinine level and her vitamin A level. Several months ago, Allie's creatinine level was high but it wasn't because of eating too many "orange" things. The doctors told us not to worry about it, however her doctor yesterday wanted it re-tested. She is thinking it's possible that Allie is getting too much vitamin A and that is causing her to turn yellow. We don't know but hopefully the blood work will give us some answers. 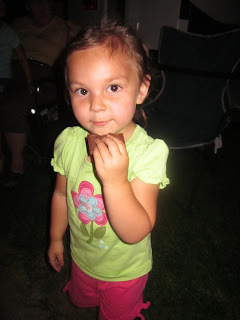 The doctor is also thinking of testing Allie for "Turner Syndrome". One of the major characteristics of that syndrome is short stature. We decided it wasn't necessary to test her quite yet but we will think about it for the future. A lot more was discussed at the appointment but these were most of the highlights. So, we sit and wait for results. This doctor said right away it's obvious that Allie doesn't feel the hunger sensation and she said Allie's health issue with that started in utero. She said that since she was born SGA, her body wasn't processing the hunger signal while in my belly and that was the start of her eating issues. She said that if Allie felt the hunger sensation, she wouldn't have been born SGA because i was providing all the nutrition she needed, however her body wasn't accepting or getting it. It was interesting, however no doctor can tell me who we need to see in getting this diagnosis or how to treat it. Overall the appointment was good and we are hoping to get some answers from the blood work and bone age test. We should get results for some of the tests by the end of next week. I'll let you know what we find out. My little beam of sunshine! Allie has been doing good and she seems happy to be back on her feeds. We are still working our way up to full feeds but it's taking a while. She is currently getting 4 feeds a day and 4 oz each. She is handling the BD really well again. Unfortunately, Allie hasn't gained any weight yet. I'm really bummed about this but I kind of expected it. It's so hard for Allie to gain weight - seems like we can pump her with tons of food and she just burns it all off. I'm making her BD's more calories per oz but that doesn't seem to be working. I know that with time, Allie will start gaining weight again - it's just frustrating in the meantime. 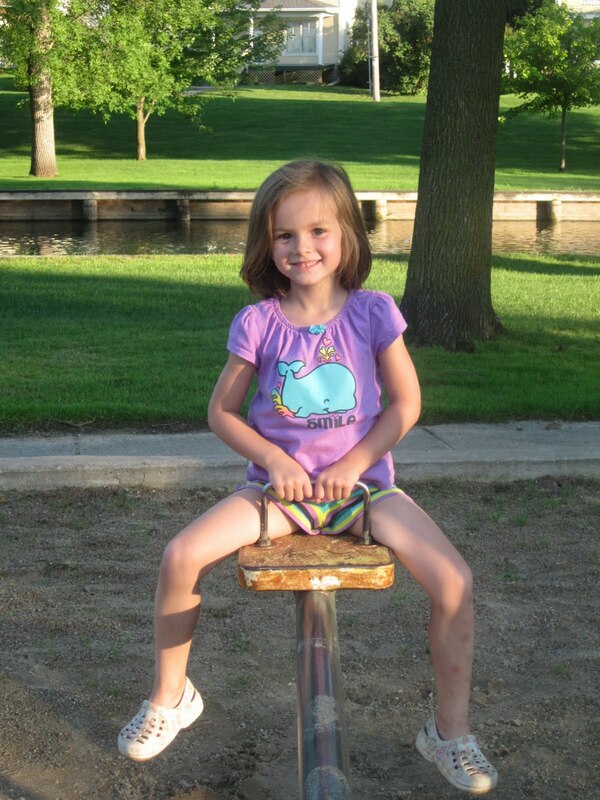 Allie is scheduled to meet the full feeding team at the Children's Hospital of Wisconsin on September 7th. This appointment is to determine if she is a candidate for the 2 week inpatient feeding program or not. Even if Allie is determined to be a candidate, we are not sure if we will take her to the program or not. I haven't made up my mind as to what is best for little Allie. Once I talked to every member of the feeding program, I might have a better feeling about what is best for Allie. So, in the meantime, we are getting ready for school. 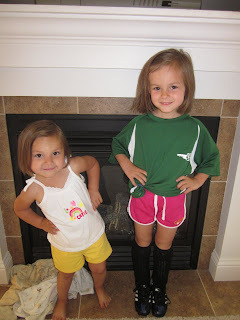 Chloe starts kindergarten and Allie starts preschool on September 1st. It's coming up quickly!!! Tomorrow is kind of a big day for Allie meeting he new Endocrinologist, I'll let you know how the appointment goes. If we get home from her appointment in Marshfield early enough, she has preschool orientation. That should be interesting because she keeps telling me she's not going to school - little stinker! Allie said, "heck with the smores I just want the chocolate". I called the Endocrine clinic at the Children's Hospital of Wisconsin today. To my surprise, I was able to talk to a nurse and she was very helpful in offering me information on what they did for Allie back on June 8, 2009. This was one of our first appointments with a specialist and honestly I couldn't remember exactly what they did for Allie. I basically only remember meeting them once and them telling us everything was fine from their standpoint and they were referring us over the feeding clinic. The reason these labs were drawn by her Pediatrician, is because Allie had such a high fever she was almost unresponsive. We spent all day in the doctors office trying to figure out what was wrong. The nurse I talked to today said that the Endocrine clinic didn't diagnose Allie as SGA (small for gestational age), however the following doctors, GI, Psychologist, Dietician, Genetics and Neurologist, all specialist that Allie was seeing, had all declared her SGA in their records. Doesn't make sense - Endocrine doesn't diagnose her with this - the one specialist that specialises in this????? Yet, while on the phone with the nurse, I gave her Allie's birth weight and height and she said, "yes, according to our charts, Allie was SGA". The whole conversation was a bit strange. The nurse told me that since Allie was SGA, the doctors usually give children till the age of 3 years to catch up height wise. She said that if they don't catch up by the age of 3, they probably won't catch up. 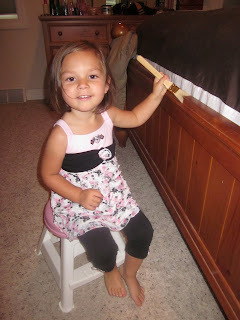 Well, Allie is over 3 and still not registering on the growth chart for her height. The nurse recommended we get Allie into an Endocrinologist right away to be evaluated. We are one step ahead of her because Allie already has an appointment scheduled for the end of August at the Marshfield Clinic. It gives a lot of great information. Allie is continuing to do well and she is a very happy girl now that she is back on her tube feedings. For lunch today, Allie wanted me to feed her chocolate milk through her tube - so I did. Allie was so excited. 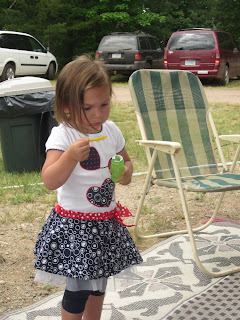 Yesterday when I was making her blends, she asked if we could put a cookie in her blend - she loved that! She's quite the character that is for sure! I received a call from Allie's GI nurse this afternoon. Allie's GI doctor was out of town last week and she was just following up with his recommendations based on Allie's last weight check. Dr. Brown was recommending we start her tube feeds back up but continuously feed her though out the night up to 8 oz and not do daytime feeds. His thoughts were this would allow her to be hungry during the day. 1) Going back to night time feeds is a step backwards for us. 2) Doing continuous feeds is a step backwards also. 4) I honestly don't think Allie feels hunger in the first place so tube feeding her all night OR all day isn't going to make a difference with her oral eating. Maybe the doctor knows something I don't know but since they cannot get us in to see him until the end of August, it must not be too critical in regards to how I am getting the food into her. I am currently giving her 12 oz total for the day and we are working our way up to more. If I followed the doctors advice, she would be getting 8 oz a day. I am going to continue offering her food at every meal and if she chooses not to eat, then I will give her tube feeding. She is getting 3 oz of blenderized diet for breakfast, lunch, dinner & before bed. This routine is giving her tummy plenty of time to empty between meals - so she should still be able to feel hungry. Once again, I'm going with my mommy instinct and praying it's the right decision! It just so happens that a couple of Allie's doctors do not think she is growing properly. Basically they think she should be growing more than she is. So, we will now add another specialist to her list of doctors. 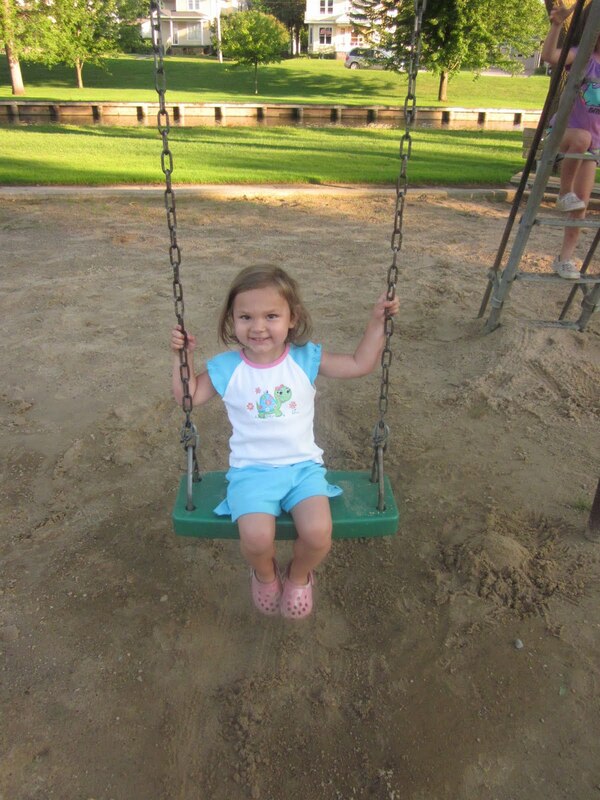 I have been working with her Pediatrician on Allie's referral to meet a pediatric endocrinologist. We picked a female doctor located at the Marshfield Clinic. To my surprise, we were able to get in quickly and our appointment is scheduled for August 25th at 2:15. I was thrilled that we could get in so soon - most of the time we are waiting months to meet a new doctor. 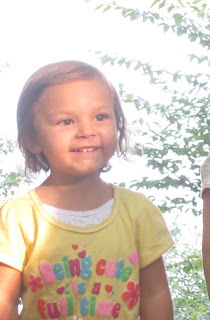 This will not be the first time we have met an endocrinologist for Allie. Back in January 2009 when we started seeing doctors in regards to her eating issues, we went to the Children's Hospital of Wisconsin and met an endocrinologist. That was actually the first specialist we ever met with for Allie. They ran a couple tests and claimed everything was okay then referred us to the feeding clinic. I honestly cannot remember what tests they ran for her but you can bet that I will be obtaining the records shortly. I'm not especially thrilled to be meeting a new doctor for Allie but hey, it's one more thing we can cross off the list or it might be one thing that helps us figure out her medical mystery. There is no doubt Allie is little for her age and her projected height is very short. So, we'll see what the specialist says the end of August. Once again I have heard the dreaded words, "There is no reason to continue this because I honestly cannot help you anymore. I have never seen a child like Allie and I've done everything I could". I of course didn't hear that exact wording from Allie's feeding therapist, but it sums it up pretty well. And honestly, I agree with the therapist 100%. Even though I agree with her, it is still hard to digest that another professional is completely stumped by little Allie. 5) She will come to the table to eat (or start to eat actually) - willingly! These are great accomplishments but we are currently at the point where it's obvious her eating is irregular and not consistent. There are days she will eat at therapy with no problem and other days there is no way we are getting her to eat. On the days that she does eat, we always end up bribing her with a new toys, etc. There is no doubt Allie eats better at therapy than she does at home simply because they have a huge playroom she gets to go into if she eats. With everything our therapist has observed, she simply thinks Allie doesn't feel the "hunger sensation". There is nothing driving her to eat besides when we bribe her with a new toy. Our therapist doesn't want to waste our time when she truly doesn't know how else to help Allie. Our therapists first thoughts on Allie (6 months ago) was that Allie's eating was behavioral. However, after watching Allie and working with her feeding, she now knows Allie's eating is not behavioral. Simply Allie will come to the table to eat its just not regularly. Our therapist is stumped by Allie - just like every other professional we have met so far. So, at this time, we are done with feeding therapy but will continue with her speech therapy twice a week. I'm sad to see us ending feeding therapy but I agree it was getting to be a waste of time. I'm fortunate our therapist even came to our house to see our routine and help with Allie eating at home. Unfortunately, it was not successful but not because we didn't try everything - I truly believe it's because Allie simply doesn't feel hunger. So - 41 days with no tube feeds and Allie is down 2.2 pounds total. She has lost 8.03% of her body weight and I am no longer comfortable withholding her feeds. 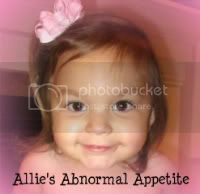 There is no indicaion at all that Allie will start to eat, if anything, her oral intake has decreased dramatically in the last two weeks. Of course our GI doctor is out of the office until Monday so I don't know what he's thinking, but quite honestly, it wouldn't matter because my motherly instinct is telling me this wean is no longer safe for Allie. So back to a blenderized diet we go. It's not the worst thing but quite honesty, I was praying for a successful wean. You wonder if the wean feels like a failure and there is no question about it - it sure does. I'm still struggling with the fact that I simply cannot get my child to do one of the most natural things in the world - EAT! I am more convinced now than ever that Allie simply doesn't feel the hunger sensation. There is just no way that a child could go 41 days without full nutrition and not be absolutely starving. Allie is continuing to refuse food after taking only 2-4 bites. There is absolutely no way that she is getting full on 2-4 bites - this whole thing just doesn't make sense. So, as I sit here and think about our tube weaning journey, I am proud we have made it 41 days, however I was also praying our outcome would be much different. I thought I was seeing light at the end of the tunnel but quickly that light has faded and we are right back to the beginning. Am I upset that the wean failed???? There is no question about it, I'm upset, pissed, dissapointed, frustrated, stressed, and down right mad. I was praying so hard that this would all work out in the end. But, now I have a little girl who is 2 pounds lighter and I know what a struggle it is for her to gain weight. 2 pound might not seem like a big deal BUT when you only weigh 20 some pounds, 2 pounds is a lot. Allie currently weighs 25.2 pounds she started her wein at 27.4. There is a lot more happenng in Allie's little world and I'll blog about it tomorrow but for right now, I need to simply process everything that is happening. I'm proud of Allie for trying to eat for 41 days and I know she would eat if there wasn't somethin stopping her. I know Allie isn't starving herself on purpose - we just need to get to the bottom of her medical issues so we can move forward with her eating issues.